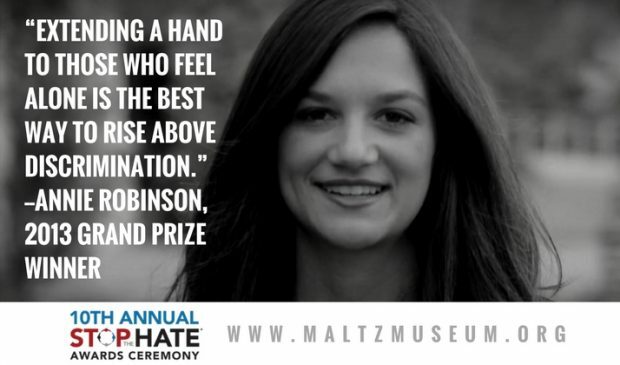 In 2013, Annie Robinson was the fifth Stop the Hate® grand prize winner. Read her essay below and register for the awards ceremony HERE. As I reached up and felt the smooth, round, soft patch of skin on the back of my head where my long locks of brown hair had previously been, I felt the fear and uncertainty of what my disease would become boil up inside of me. Almost paralyzed by the fear of others discovering my secret, my mom and I began our morning ritual of covering the bald patches that had appeared on top of my head with a thick black headband. At school, this disguise allowed me to feel like everyone else and momentarily focus on a fun game of tag. I was shocked back to reality by the grasp of a boy’s hand ripping the headband from my head. My heart dropped to my toes as he yelled out to everyone around “Ew! You’re bald!” Laughter and shock filled the air. His words and the words of other kids calling me “weird” and “disgusting” are still imprinted into my darkest memories and remain a constant reminder of how I was different. Many days, I returned home from school in tears brought on by hurtful words from my classmates. My mom would hold me, promising that my condition would never hold me back from doing anything I set my mind too. I suffered bullying and rejection at its worst after being diagnosed with alopecia areata, and more than anything else, I just wanted to be cured and the hatred to stop. The painful words and my mom’s deep encouragement motivated me to make a positive change. With the hope of a cure, we were led to an organization called Wigs for Kids, which provided me with countless hairpieces over the years, confidence, poise, and an understanding of true beauty. I soon learned that if you love yourself the hate of others becomes insignificant. The founder of Wigs for Kids, Jeffrey Paul, asked me to become their National Child Spokesperson at the age of twelve, and although it meant sharing my secret it became therapeutic to help others by speaking out against hate instead of allowing it to hold me back. It became my personal mission to encourage others to celebrate our unique qualities instead of magnify our differences. Public speaking and helping others has become my passion. Through my role with Wigs for Kids I have had the opportunity to share my message at the annual zoo walk, participate in public service announcements, and many other fundraising events. Recently, I was inducted into The National Honors Society at my high school, and I plan to use this venue to continue to educate others and promote a message of inclusion. I also plan to attend and graduate from college with a degree in communications and pursue public speaking. Everyone’s greatest fear is being different and feeling rejected. I now realize that extending a hand to those who feel alone is the best way to rise above discrimination. After all, aren’t our differences ultimately what make us the same?